AS7008T - ACE Peripherals ::: Completing I.T. 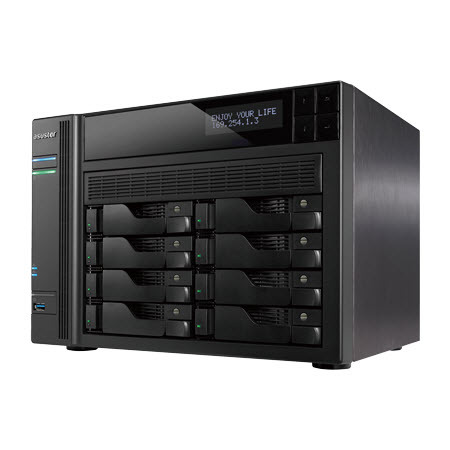 The AS7008T offers comprehensive backup solutions and stunning high definition multimedia processing in a high performance package that supercharges your NAS experience. *Two different camera license packages are offered: single channel and 4 channels. Currently, the 70 Series devices can be expanded up to a maximum of 16 channels. *In order to provide stable surveillance system resources, the local display function will be shut off after the NAS has enabled add-on licenses. ASUSTOR Data Master (ADM) is an operating system developed by ASUSTOR Inc. that comes pre-installed with all ASUSTOR NAS devices. ADM was designed around the use of applications and its original web-based graphical user interface allows you to handily organize your applications by page. ADM supports multi-tasking and also comes pre-installed with a rich assortment of applications. Furthermore, you can use App Central to install any additional apps that you may need, creating a personalized and multi-featured NAS device for yourself. The applications that come pre-installed with each ASUSTOR NAS device are just the beginning. At your convenience, you can browse through and download any applications that peak your interest from App Central. App Central allows you to explore the unlimited potential of ASUSTOR NAS devices while creating a personalized NAS device for yourself. Whether your interests lie in business, website construction or even digital home entertainment, App Central provides you with the boundless variety of applications that you require to satisfy your digital lifestyle needs. As a responsible citizen of the Earth, it is our mission to continue to develop superior energy saving and energy efficient products. From their inception, all ASUSTOR NAS products are designed and developed around ecologically friendly concepts. When in use, our devices consume far less power than the average computer or server. Furthermore, our advanced power control features allow you to more efficiently manage your NAS device and hard drives. This lowers your electric bill and prolongs the lifespan of your hard drives all at the same time. Our power saving features include Wake-on-LAN, System Sleep Mode (S3), power management schedules, power management for LEDs, and smart fans. We also support the mounting and sharing of ISO files, which helps to lower CD and DVD waste. 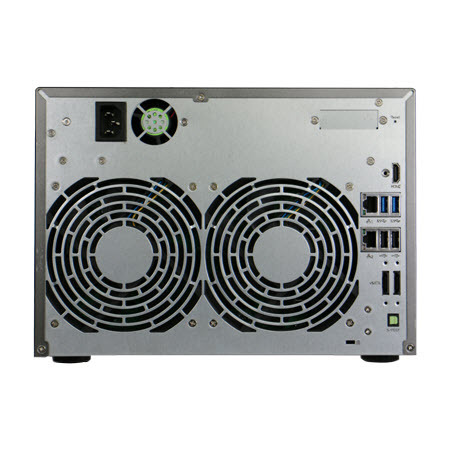 Finally, all ASUSTOR NAS products are constructed in accordance with RoHS standards and use recyclable packaging materials, striving for the smallest ecological footprint possible. ADM comes with an innovative yet intuitive graphical user interface (GUI) that features familiar modern OS controls making operation a breeze. True multitasking and background operation substantially enhance your productivity. With a myriad of customizable design options, everyone is free to create a personalized and unique homescreen for themselves. Using backup utilities such as Backup Plan and Apple Time Machine you can easily backup data from a Windows PC or Mac directly onto an ASUSTOR NAS device. For added security, you can also further back up the data from a NAS device onto other devices. 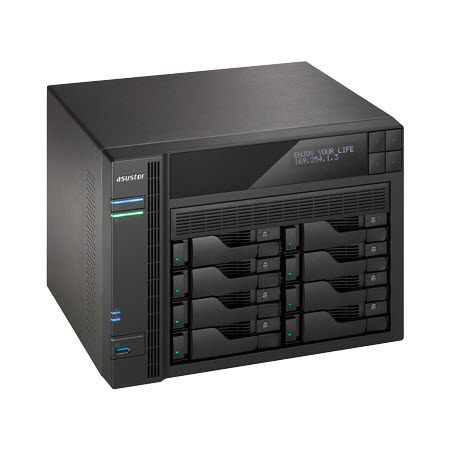 ASUSTOR NAS devices support backup via the cloud, external hard drive, Rsync and FTP. Additionally, a variety of different RAID configurations are offered, allowing you to select the most appropriate configuration for your security needs. 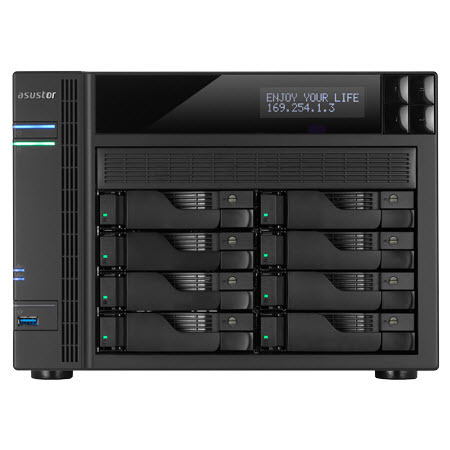 ASUSTOR NAS devices allow you to enjoy the conveniences of cloud computing, while simultaneously providing you with data security of the highest standard. All our devices come pre-installed with ADM Defender, which protects your data against malicious attacks. Secure multitenancy and SSL encryption allow all users to access their data in a protected environment. As well, military grade AES 256-bit encryption for individual shared folders gives you the type of security you need for your most confidential data. Finally, our pre-installed Surveillance Center caters to your other security needs by allowing you to collectively manage an array of IP cameras. In the event of any disruptions, Surveillance Center will notify you at once. Using Windows AD authentication and authorization, you can add ASUSTOR NAS devices to any existing AD domain. This allows users in the domain to use currently existing accounts to log on to the NAS device, substantially lowering IT labor costs. As the name might suggest, Dr. ASUSTOR acts like a family physician and performs general checkups on all of your settings. If certain settings are found to be compromising the security of your system or data, Dr. ASUSTOR will provide you with the appropriate set of instructions to fully restore security and protection. Worried about how safe the data that you have put in public cloud storage is? You can now use ASUSTOR NAS devices to effortlessly create a private cloud storage space for yourself. Using our exclusive Cloud Connect™1 technology, you can access the data on your NAS device from almost anywhere on the planet. Whether by computer or mobile device2, you need only an internet connection to access your NAS device from anywhere and at any time. ¹ This function may be restricted to a certain extent depending on your network environment (i.e., router). In order to ensure the normal operation of this function, it is recommended that you use a compatible router. ² Please first install the ASUSTOR mobile device application. For additional details, please search for ASUSTOR in the App Store or Google Play (Play Store). 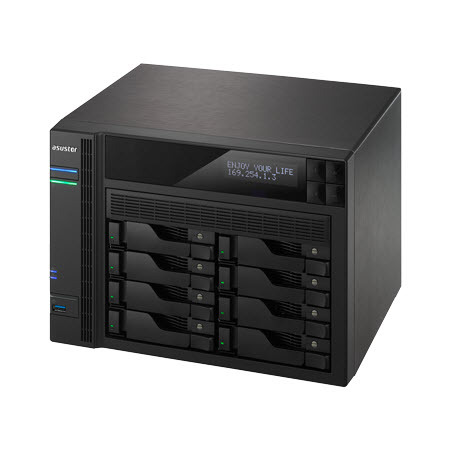 ASUSTOR NAS devices not only act as a dependable storage server. The installation of different applications can allow your NAS device to become the hub of your digital home entertainment. UPnP AV Multimedia Server and iTunes Server apps let you enjoy digital entertainment in every corner of your home. The Download Center app acts as your dependable download assistant. It supports HTTP, FTP and BT downloads while also allowing you to schedule downloads to your liking. Finally, acting as an ever vigilant sentry, the Surveillance Center app can provide 24 hour home security monitoring. In the event of any disruptions, Surveillance Center will notify you at once, helping you to protect your home and loved ones. Imagine having your photos, media files and important documents always at your fingertips. ASUSTOR offers many mobile applications to make your digital lifestyle more complete. Through these apps you can access the data on your NAS device from almost anywhere in the world. Still working to figure out a way to share files between your computers running different operating systems? ASUSTOR NAS devices provide seamless cross-platform file sharing. There is no need to fiddle with complicated settings. You can begin to enjoy effortless cross-platform file sharing today. ASUSTOR is committed to developing products that operate quietly and consume less power. In addition to helping you considerably lower your power bill, the quality of your life at home is also an important consideration of ours. Still using a power consuming computer as your home's multimedia server? Each and every ASUSTOR NAS can be outfitted with the UPnP Multi Media Server App, which allows it to become your home's multimedia streaming server. As long as you have devices that support UPnP (for example, SONY BRAVIA TV or PlayStation3®), you will be able to browse and stream all multimedia stored on your ASUSTOR NAS. Don't forget that you can also use UPnP or DMP compatible applications on your mobile devices to stream multimedia from your NAS. Always worried about keeping your most valued assets safe? Well worry no more. Surveillance Center provides a comprehensive solution for your most vital security needs, helping you to monitor all that you value. In the event of any disruptions its notification system will alert you immediately. Now you can enjoy the peace of mind that comes with knowing that your valued assets are well protected. Spending a lot of time fiddling with torrents, trackers and BitTorrent clients? Download Center provides a one stop solution that simplifies the entire download process. Powerful features allow you to easily search for and download the files that you need in the blink of an eye. The AiDownload mobile App allows you to use your mobile device to search, add and manage your download tasks while on the go. BitTorrent downloads have never been this convenient. Still storing your music and movie collections on different computers? Running out of disk space? iTunes Server is what you need. Now you can store all your music and movies on your ASUSTOR NAS and have them streamed to any Mac or Windows computer within the local network². AirPlay, iOS Remote pairing and playlists are also supported. For more details, be sure to check out iTunes Server in App Central. ² Please first install iTunes on your Mac or Windows computer. ¹ Hard disks not included. ³ USB Wi-Fi dongle not included. ⁴ You must first enable real time transcoding for these files in order to play them. ⁵ Metadata (e.g. title) may not be able to displayed in iTunes. ⁶ ASUSTOR recommends that ASUSTOR Portal be used with a TV with a resolution of 720p or higher or a monitor supporting audio output. ⁷ Currently, 2160p(4k) is only available on the 7 series. Currently only available for Windows Chrome. Installation of the VLC media player browser plug-in is required. Supports the use of DVB-T/DTMB digital TV dongles to stream and record scheduled digital TV programs.